Local Environmentalist Speaks Out Against Bear Lake Hydroelectric Proposal. 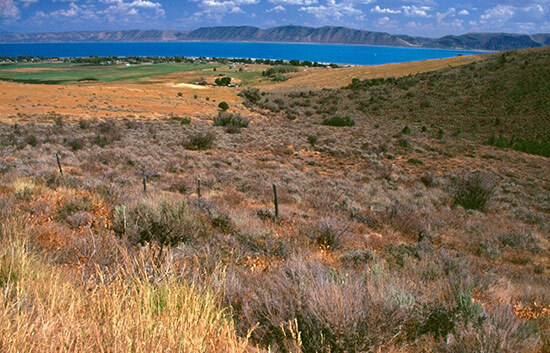 Most folks in SE Idaho and Northern Utah are well aware of Bear Lake, a long and very deep lake straddling the border of the two states. It is also very close to Wyoming. The lake has always had an unusual, beautiful blue color, and it harbors five rare species of fish. There is the Bear Lake strain of the Bonneville cutthroat trout, Bonneville cisco (unique to this lake), Bonneville whitefish, Bear Lake whitefish, Bear Lake sculpin (found only in Bear Lake). Recreational use has been grown strongly in recent years, and the vacation home developments are becoming more and more intrusive. Resort plans take shape. Jackson Hole Star Tribune. Currently, there is much controversy and local opposition to this pumped storage hydroelectric project. Fears are it could change the lake’s color and devastate the ecology and recreation as well as the local economy. © Ralph Maughan. Bear Lake, Utah. Photo is to the NE from the foothills of the Bear River mountain Range. the lake really is the amazing blue color in the photo, and conserving that is a big issue. There is a contradiction that borders on hypocrisy regarding power generation in this country. We all use electricity, but any efforts at generating new electricity is met with opposing efforts. We don’t want any new coal-fired power plants. We don’t want any dams. We don’t want any new nuclear power plants. We don’t want any more natural gas wells to pop up anywhere. We don’t want to develop new domestic sources of oil. Okay, so let’s form a line. Everyone that opposes any new electricity generation step up, volunteer to give up your current source of electricity, and that will prevent us from having to find new sources of electricity production in the future. Yeah, that is what I thought. SmokyMtnMan: Good points. The only way to reduce energy consumption is lower population growth & that isn’t going to happen. We are living in a world that can be described as the “careless plenty”. A professor, DR. Bogue (U of Chicago) predicted in the 1970’s that America’s population growth would level off at 220 million which a laugh, we are now in excess of 300 million. The proposed hydroelectric pump will not produce a net gain in electricity. They want to pump water from the lake up the hill at night and then let t run back down the hill during the day time. The net energy consumed is negative. It will be taking advantage costs being higher during the day and lower at night to earn money. Besides not creating a net gain in electricity the pump will kick up the calcium carbonate on the bottom of the lake. The kicked up calcium carbonate will destroying the azure blue color, kill the fish by suffocating their eggs, stop the lake from freezing the winter (this produces increased smog in mountain valleys). These environmental impacts will destroy the economy of the Bear Lake Valley. By 2050 the U.S. population will be around 400 million. We are paying a very high environmental price to support our population of 300 million today. I don’t even want to consider the price we will pay for 400 million U.S. citizens. I disagree that the only way to reduce energy consumption is by reducing population growth. Population growth in the US is almost totally driven by immigration (the current birth rate is right around replacement rate). Thus, one could conceivably shut down population growth simply by restricting immigration (which, I admit, is very unlikely). However, we can also reduce energy consumption by buying more efficient appliances, replacing old light bulbs with compact fluorescents, traveling less, living closer to where we work, riding bicycles, turning the heat down during the day/late night, installing insulation, building more efficient homes, and the list goes on and on and on. Many people are doing these things, and many more want to know how. In my opinion, the fact that (often) local people step up to oppose such projects is good! It means someone is holding these large corporations accountable. If you want to build a coal-fired power plant, by god, we’re going to make sure it’s clean; if you’re going to build a dam, we’re going to make sure it does not impact endangered species. Some still get built, many don’t; hopefully the cleaner, more “environmentally friendly” projects are the ones that go forward. P.S. Rather than dams and coal-fired power plants, we should be looking at building more solar power plants and windmills. Some will oppose these as well, but it would be a cleaner, cheaper, renewable source of energy. JB, I agree there are opportunities for clean energy that can be expanded. For example in 2007, the wind energy in the US nearly doubled from what it was the previous year to 16,800 Mega Watts which is enough energy to support about 5 million homes but still represents a small, small portion of this countries clean energy needs. Humanity is now in a race aganist time that I am not optimitic that we will win. I just wanted folks to note the comment by Alison Wood above. It is something I should have mentioned. This is a pumped storage project and generates no net energy. They actually result in a net loss of energy. These projects (pumped storage) flatten out the load of electricity over the period of a day. That is useful in load management, but it is not a source of energy. The Pocatello newspaper, the Idaho State Journal, today revealed that the proposed billion dollar pumped storage project will produce 25% less power than it would use. It would cause Bear Lake to go up and down about 3 inches a day. This is a lot of water because it is a lake with great volume. Trout Unlimited worried about the adverse effects of such a massive pumping and spilling of water into the lake. The project would be built by Symbiotics LLC. I know they proposed other controversial projects, such as a second dam at the Bear River Narrows, upstream from Preston, Idaho. It was strongly opposed by fishers and floaters and defeated.